It’s that spoooooky time of year! Ok not really THAT spooky around here, but I am having fun putting together some cute Halloween decorations around the house! 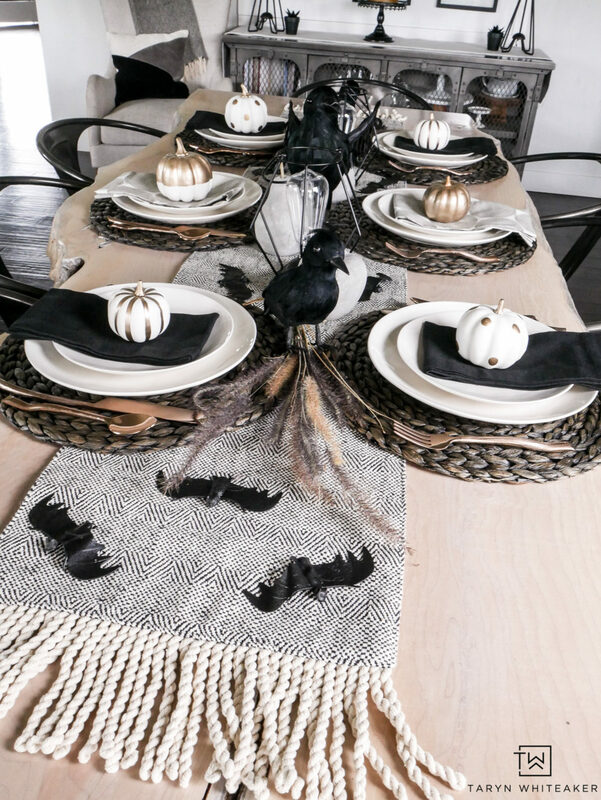 I revealed our black and white halloween gallery wall the other week (get the free printables here) and now I’m showing you the cute and quick black and white Halloween table decorations I put together! 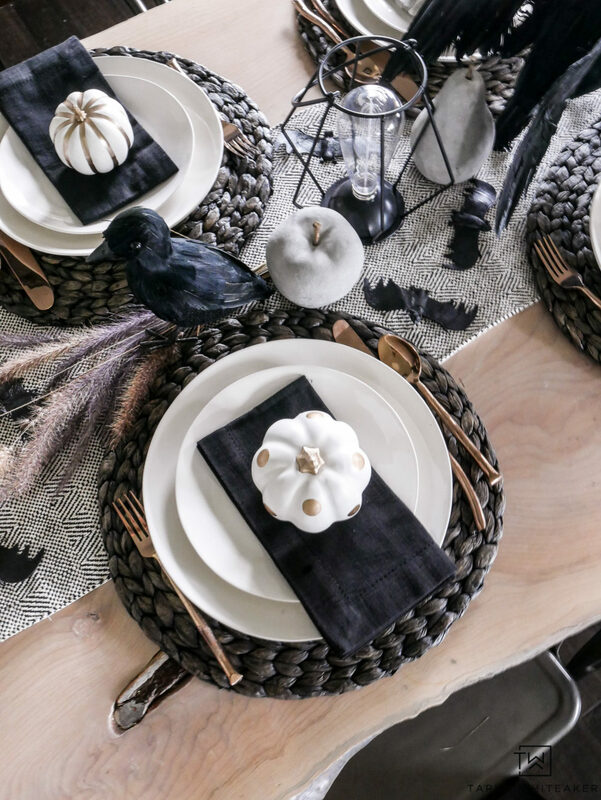 I’m sharing our little Halloween tablescape along with Kristen from Ella Claire among other bloggers, so keep scrolling to see all the other spooky decor! 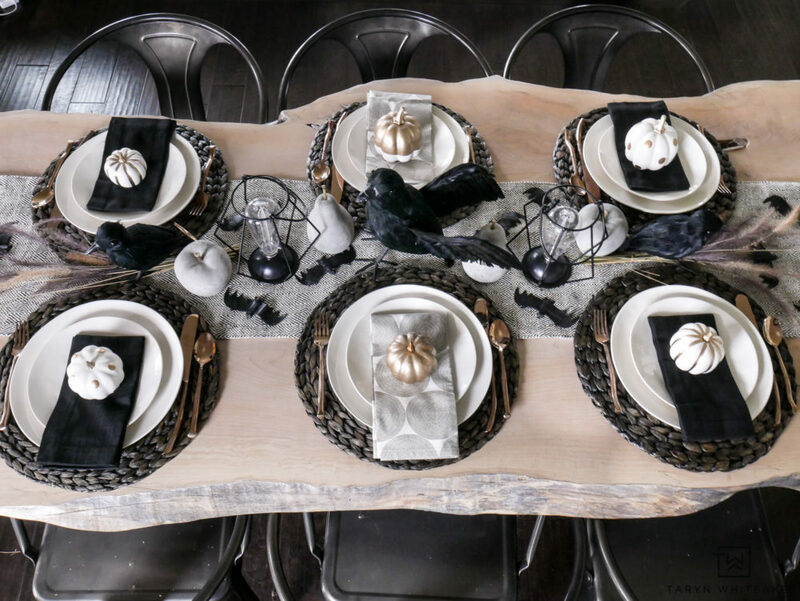 My Halloween table was actually inspired by my fall table this year. 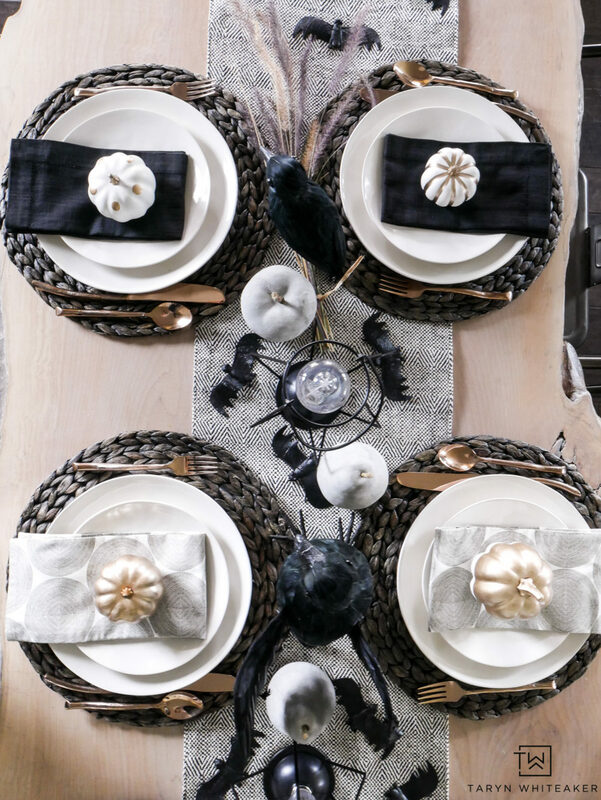 I loved the look but made just a few changes to turn it into a classy Halloween table. 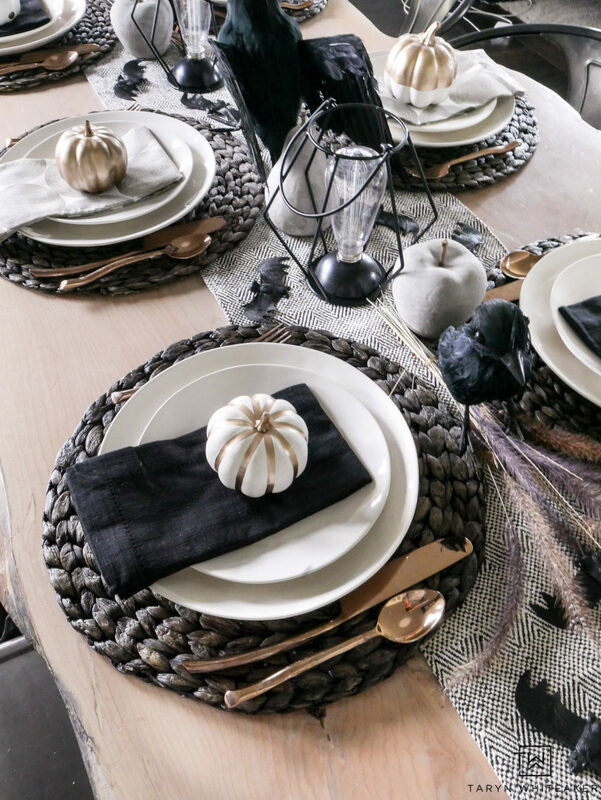 I used roughly the same place setting design, but added these cute Baby White and Gold Pumpkins and black napkins. 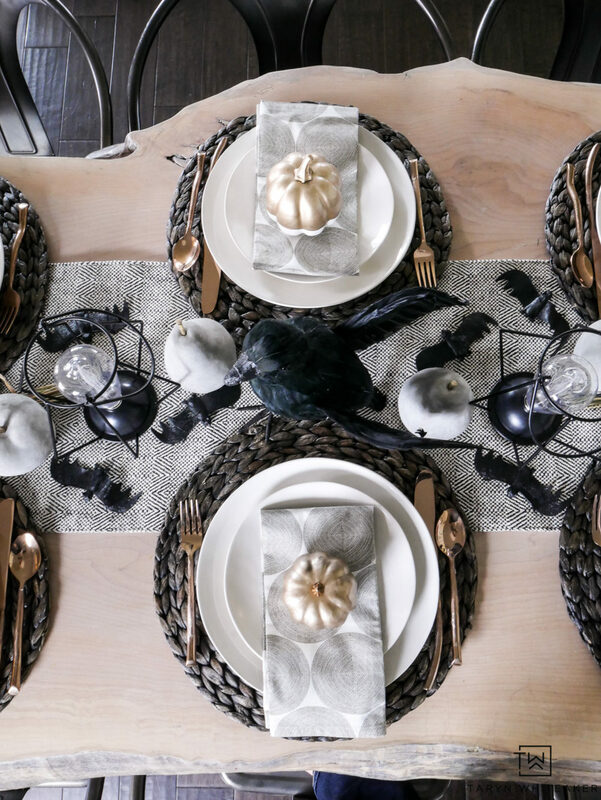 All the cute and classy Halloween decor came from JOANN Stores! 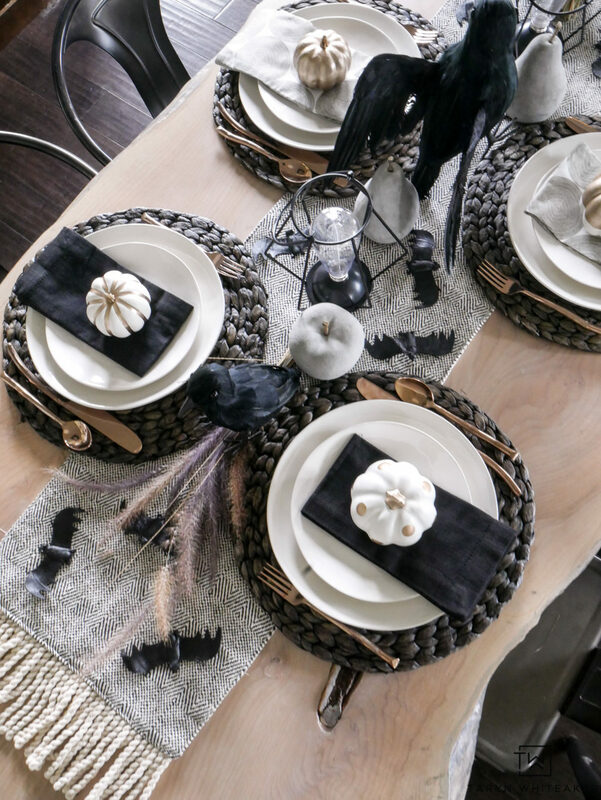 I used a black and ivory table runner I had tucked away, and added a few little bats, Large Flying Crow (which really creeped my family out), concrete fruit and Black Edison Bulk Lanterns. 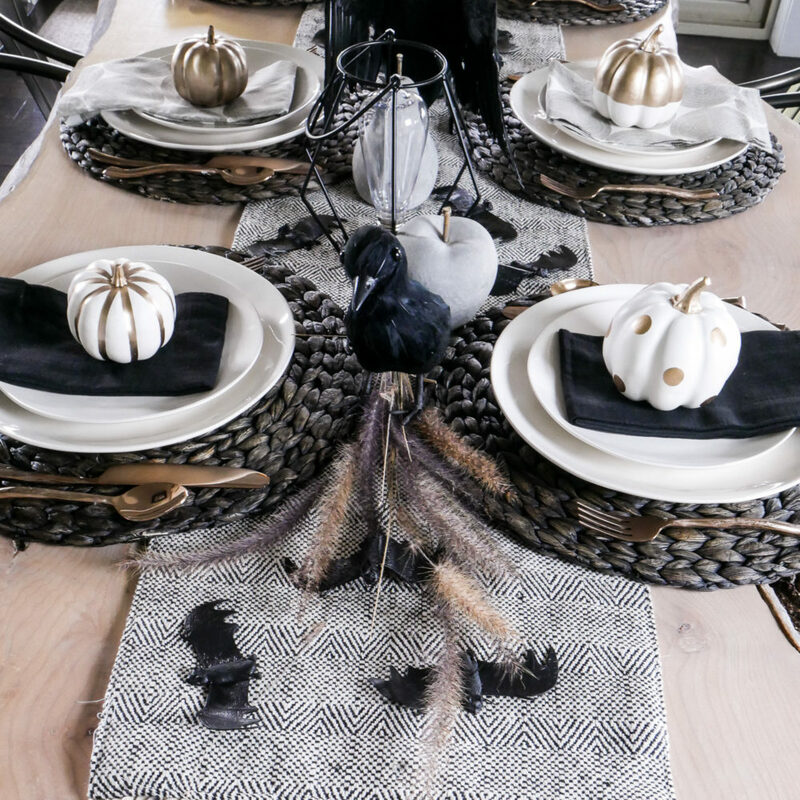 It’s all it took to turn this tablscape into an enchanting Halloween table! I added some texture to the table by using some grasses throughout the centerpiece! I actually cut a few stems off the tall grasses on our fall porch this year! 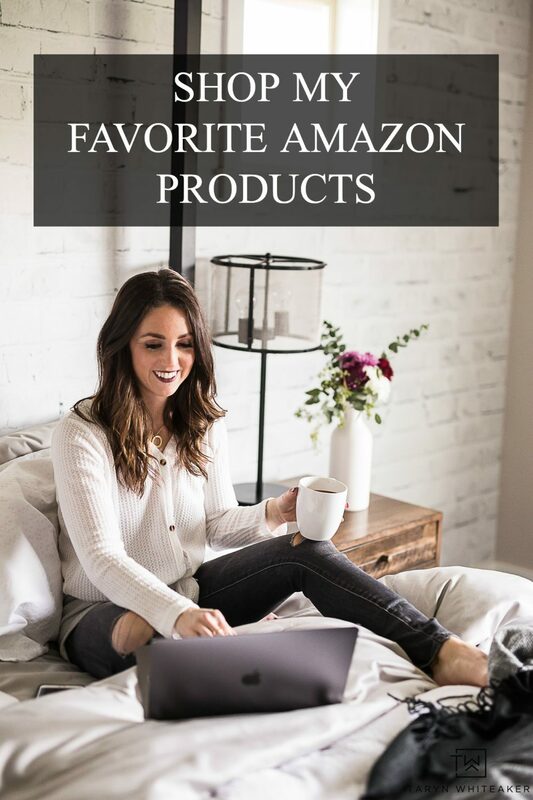 Cheap, that’s for sure! Don’t forget you can grab the free Halloween printables here! 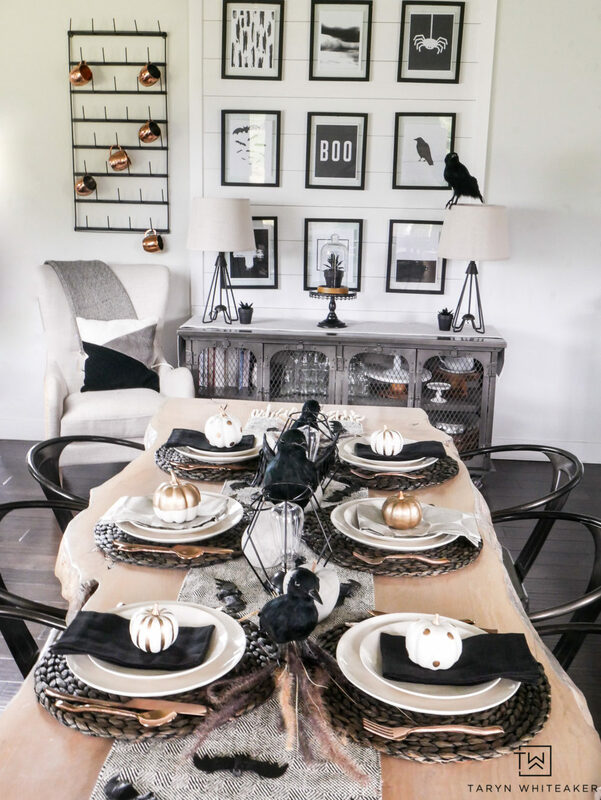 Love the copper and black together! 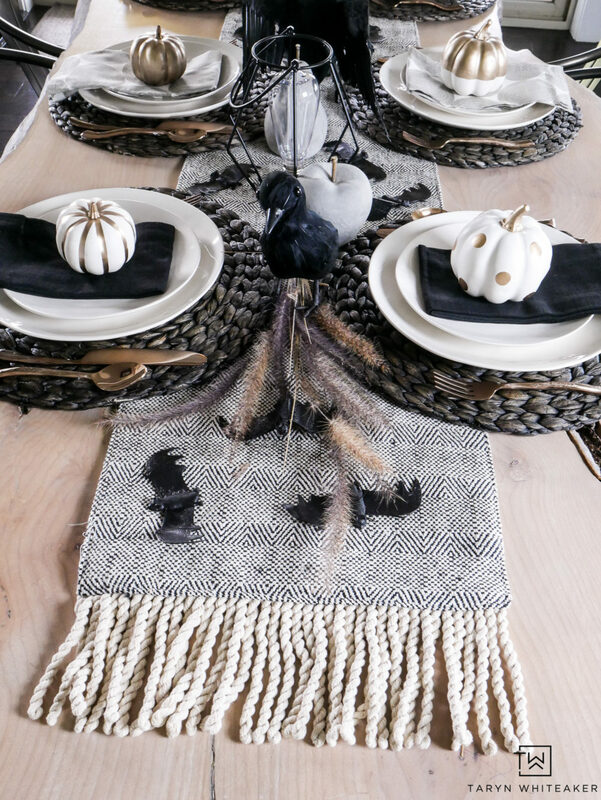 Such a beautiful Halloween table!! So classy and spooky, Taryn! I love all your spooky details. I’m batty about this – what time’s dinner? Ha! I love your witty comment! 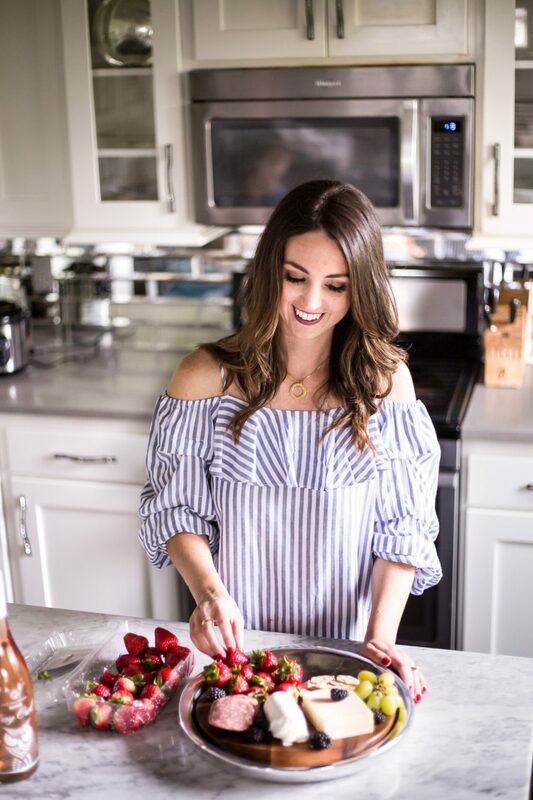 Love this tablescape so much!